Acronym used by the NSA for Communications Intelligence . COMINT is acquired by monitoring communications signals and filtering out data useful for maintaining national security. During October 1980, the NSA ffice of Policy Chief Eugene F. Yeates swore an affidavit in response to a FOIA request by CAUS. The affidavit was codeworded UMBRA, a Category III security level and the highest level for COMINT. 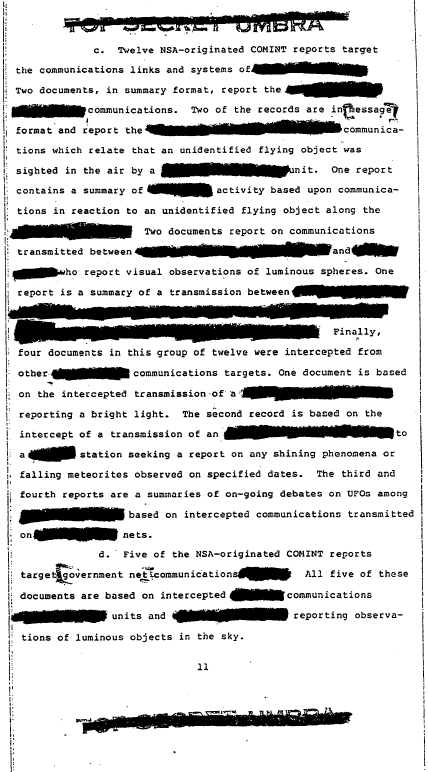 Below is a sample of the censored affidavit showing that the NSA did involve itself with UFO information and that because of its sensitive nature it was highly classified during a time when the public was led to believe that UFOs do not represent a threat to national security.